These medium to heavy duty total lock casters feature a locking system that simultaneously locks both the wheel and swivel head through the use of an easy to operate foot pedal. Also features a heat treated double ball bearing raceway, bright zinc plating, and hardened components. 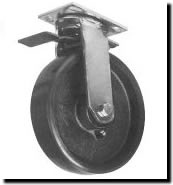 Options are available for heavy duty kingpinless casters to increase the ease of maintenance and performance of the caster. Top Plate Dimensions:4" x 4-1/2"
Bolt Hole Spacing: 2-5/8" x 3" to 3" x 3"
Rubber on Steel 400 NCC-TTL30S420-RSR 6.46 "
Rubber on Aluminum 400 NCC-TTL30S420-RAR 5.36 "
Rubber on Polyolefin 350 NCC-TTL30S420-TPRR 4.26 "
Polyurethane on Polyolefin 700 NCC-TTL30S420-PPUR 4.26 "
Polyurethane on Steel 700 NCC-TTL30S420-PUR 6.46 "
Solid Polyurethane 700 NCC-TTL30S420-SPUR 4.36 "
4" 2 Polyurethane on Aluminum 700 5-5/8 NCC-TTL30S420-PAR 5.36 "
Cushion Polyurethane on Polyolefin 450 NCC-TTL30S420-SCR 4.26 "
EZ Rolling Polyurethasne on Steel 700 NCC-TTL30S420-EZPUR 7.05 "
Semi Steel 700 NCC-TTL30S420-SSR 6.32 "
Heavy Duty Steel 900 NCC-TTL30S420-SSR-HD 7.02 "
EZ Rolling Steel 1200 NCC-TTL30S420-CDSR 7.55 "
Polyolefin 500 NCC-TTL30S420-POR 5.36 "
Phenolic 800 NCC-TTL30S420-PHR 5.55 "
High Temp Phenolic 800 NCC-TTL30S420-PHR-HT 5.55 "
Rubber on Aluminum 500 NCC-TTL30S520-RAR 6.05 "
Rubber on Polyolefin 325 NCC-TTL30S520-TPRR 4.62 "
Polyurethane on Polyolefin 750 NCC-TTL30S520-PPUR 4.62 "
Polyurethane on Steel 1000 NCC-TTL30S520-PUR 6.90 "
Solid Polyurethane 1000 NCC-TTL30S520-SPUR 4.92 "
5" 2 Polyurethane on Aluminum 1000 6-1/2 NCC-TTL30S520-PAR 5.58 "
Cushion Polyurethane on Polyolefin 750 NCC-TTL30S520-SCR 4.92 "
EZ Rolling Polyurethasne on Steel 1200 NCC-TTL30S520-EZPUR 7.20 "
Semi Steel 1000 NCC-TTL30S520-SSR 8.33 "
Heavy Duty Steel 1200 NCC-TTL30S520-SSR-HD 9.30 "
EZ Rolling Ductile Steel 1200 NCC-TTL30S520-CDSR 9.30 "
Polyolefin 650 NCC-TTL30S520-POR 4.92 "
Phenolic 1000 NCC-TTL30S520-PHR 6.05 "
High Temp Phenolic 1000 NCC-TTL30S520-PHR-HT 6.05 "
Rubber on Steel 600 NCC-TTL30S620-RSR 7.70 "
Rubber on Aluminum 1000 NCC-TTL30S620-RAR 6.50 "
Rubber on Polyolefin 450 NCC-TTL30S620-TPRR 5.06 "
Polyurethane on Polyolefin 550 NCC-TTL30S620-PPUR 5.06 "
Polyurethane on Steel 1200 NCC-TTL30S620-PUR 8.58 "
Solid Polyurethane 1200 NCC-TTL30S620-SPUR 5.06 "
6" 2 Polyurethane on Aluminum 1200 7-1/2 NCC-TTL30S620-PAR 6.00 "
Cushion Polyurethane on Polyolefin 550 NCC-TTL30S620-SCR 5.06 "
EZ Rolling Polyurethasne on Steel 1200 NCC-TTL30S620-EZPUR 9.00 "
Semi Steel 1250 NCC-TTL30S620-SSR 8.58 "
Heavy Duty Steel 1200 NCC-TTL30S620-SSR-HD 9.60 "
Ductile Steel 1250 NCC-TTL30S620-DSR 9.60 "
EZ Rolling Ductile Steel 1200 NCC-TTL30S620-CDSR 9.60 "
Polyolefin 700 NCC-TTL30S620-POR 5.06 "
Phenolic 1200 NCC-TTL30S620-PHR 7.50 "
High Temp Phenolic 1200 NCC-TTL30S620-PHR-HT 7.50 "
Rubber on Steel 675 NCC-TTL30S820-RSR 9.68 "
Rubber on Aluminum 1000 NCC-TTL30S820-RAR 7.50 "
Rubber on Polyolefin 500 NCC-TTL30S820-TPRR 5.50 "
Polyurethane on Polyolefin 550 NCC-TTL30S820-PPUR 5.50 "
Polyurethane on Steel 1250 NCC-TTL30S820-PUR 12.10 "
Solid Polyurethane 1200 NCC-TTL30S820-SPUR 5.50 "
Polyurethane on Aluminum 1250 NCC-TTL30S820-PAR 5.50 "
8" 2 Cushion Polyurethane on Polyolefin 550 9-1/2 NCC-TTL30S820-SCR 5.50 "
EZ Rolling Polyurethasne on Steel 1200 NCC-TTL30S820-EZPUR 13.10 "
Semi Steel 1250 NCC-TTL30S820-SSR 12.10 "
Heavy Duty Steel 1200 NCC-TTL30S820-SSR-HD 13.10 "
Ductile Steel 1250 NCC-TTL30S820-DSR 13.10 "
EZ Rolling Ductile Steel 1200 NCC-TTL30S820-CDSR 13.10 "
Polyolefin 900 NCC-TTL30S820-POR 5.50 "
Phenolic 1250 NCC-TTL30S820-PHR 7.75 "